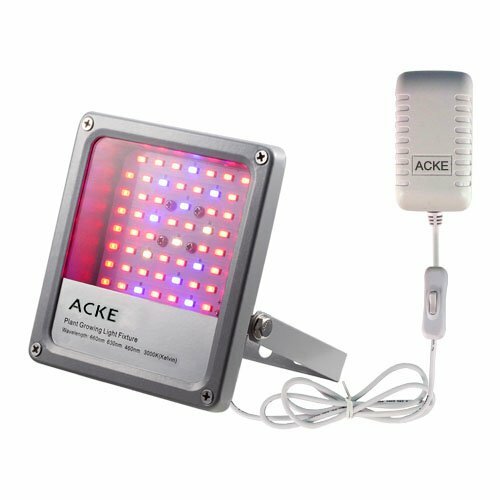 REMARK:Brand of ACKE is only available at ACKE GROW LIGHT. Bought from other sellers are fake. Best solution for your tender seedlings growing. Indoor garden,grow tent,grow room,greenhouse,aquarium for hydroponics,plant grow,seed breeding,flower blooming during cold winter and spring or less sunshine.day. cucumbers, and many other fruits and vegetables. no requirement of the plants. Maximum absorptivity for chlorophyll impact on photosynthesis and photo period effect.Best for blooming and fruit. LOWE HEAT EMIT: selected high quality of led with excellent heat dissipation heat sink,Even close the grow light to your plant,it will no burn the leaves or flowers. STRONG CONSTRUCTION:Die cast aluminum heat sink no only better heat dissipation but strong. LOW HEAT OUTPUT--Don't worry even close the lamp to your tender flowers and do not burn them. EASY INSTALLATION:--US plug with switch and long cable for your easy and quick installation.Attached a screwdriver for easy projection angle adjustment. If you have any questions about this product by ACKE, contact us by completing and submitting the form below. If you are looking for a specif part number, please include it with your message.